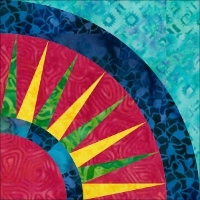 Another great pattern from Jaybird Quilts, "Science Fair" is a complicated-looking quilt that is really easy to construct. Brand new from Jaybird Quilts! "Lotus" is a fantastic pattern for showing off those larger scale prints that are just too pretty to cut. Don't you love this "Tasty" Table Runner from Jaybird Quilts? Don’t we all dream of putting our toes in the sand sometimes? Join us on a beach-hopping trip up the California coast as we visit Jaybird Quilt’s favorite beaches, making two blocks at each "stop". One of Jaybird Quilts latest creations is the Seaside Table Runner - part of her new "little patterns" line. And guess what? It's made completely from diamonds! You'll love this new pattern from Jaybird Quilts - bright, cheery and NO "Y" SEAMS! Bet you can't resist the pull of this sweet taffy! Star blocks stretch across this lite, lively and very tasty quilt in this pattern from Jaybird Quilts. We love the latest ruler from Jaybird Quilts!